battles and gains a large number of kills. Do you really know how to build a trap account?This guide written by snow queen will teach you a lot. Look weak by keeping your might as low as possible. Maximise your troop health and defense stats. much in the wrong places. quickest way to get a rough idea of how tough your opponents are. Buildings – we only want useful buildings that benefit a trap account. Research – we only want research that benefits our trap account. Leader level – we need a maxed level leader. Troops – you want the minimum number of troops to take on a full T4 march. Quests – we need to avoid collecting quest rewards where possible. stage it’s time to look at restructuring. from farm accounts, gathering your Cargo Ship. train more troops in a queue does not benefit a finished trap account. 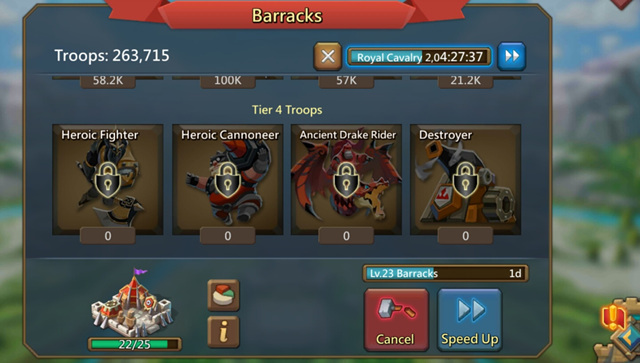 Again, once you have finished your army manors provide very little benefit to a Lords Mobile Trap account. You should destroy all of your manors. in order to protect your own troops from being killed. survive a single full T4 march on your turf. defense and health skills by the time you get a level 46 Leader. Total skill points spent: 171. Squad Health I and Squad Defense I provides a 15% boost to each stat. increase in all your troops'health and defense. out as far as you can with your remaining points. 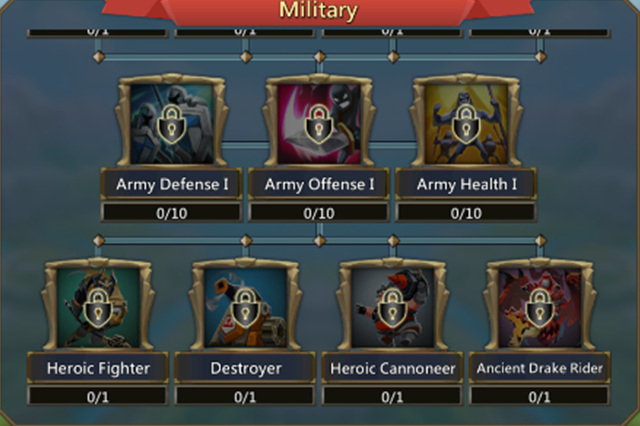 the goal of trying to maximise troop health and total defense. The above will give you a 252% boost to Army Max Health. The above will give you a 229.5% boost to Troop Defense. they will level solely on Admin, Guild and VIP guests. We want to research the bare minimum to keep our might down as low as possible. troop types in your trap account. This includes the troop attack abilities, which do come into play even when defending. Like the combat tree you want to max as much of the defense tree as you can. This means unlocking the higer tier traps and all the wall strenght abilities. You can skip this tree entirely. There are no useful abilities in the Monster Hunt tree for a trap account period. Upgrade Defenses is another good solid research tree for a trap account build. Go for as much as you can in the upgrade defenses tree. is quite far down. This ability lets you swap out leader equipment sets. quickly swap gear to your best combat set. If you don’t train Quick Swap you have to manually change every single equipment slot! use less speed ups to heal your troops after an attack. The rest of the tree is useless for a trap account. 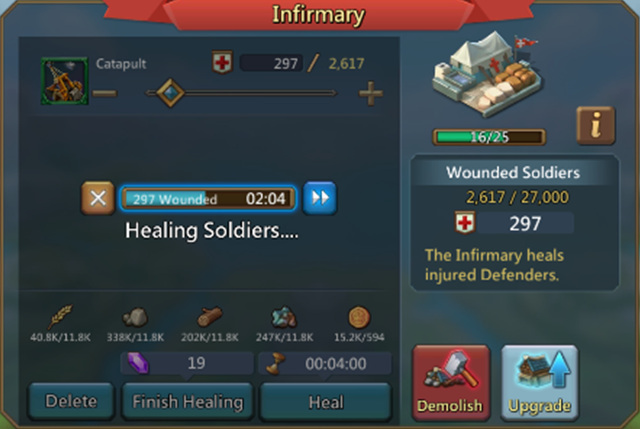 Bigger Infirmary is a must have. Army Defense II, Army Offense II, and Army Health II are obviously all very useful. However, the best three abilities in this tree for a trap account are Sabotage, Plague and Demoralize. Maxing all three will reduce your opponents whole armies attack, health, and defense by 10%. A 10% debuff to an opponent is significantly more powerful than increasing your own army’s stats by 10%. I suggest leaving this tree to last because it is a significant investment in time, resources and a large chunk of extra might added to your trap account to get those final abilities. number of traps you can build, based on your wall capacity. wall traps which are destoryed. attacking a player, it is better to only send a single troop type i.e. troop’s stats by concentrating on specific leader skills and gear. However, the opposite is true when defending. effective. A combination of tiers can also make good trap accounts. when you decide which combination of tiers to train. T2 are 2 times as strong as T1. T3 are 3 times as strong as T1. T4 are 4.5 times as strong as T1. T2 cost twice as much as T1. T3 cost 3 times as much as T1. T4 cost 20 times as much as T1. T2 takes twice as long to train than T1. T3 takes 4 times as long to train than T1. T4 takes 8 times as long to train as T1. might per troop than T1. Remember that a key point of a trap account is keeping your might as low as possible and this is really important with troops. permanently killed will be made up of your highest tier troops. – which you really don’t want. will allow you to have 375k T2, 1.5M T1, or a combination of the two. back in the knowledge that you will never have a single troop killed.